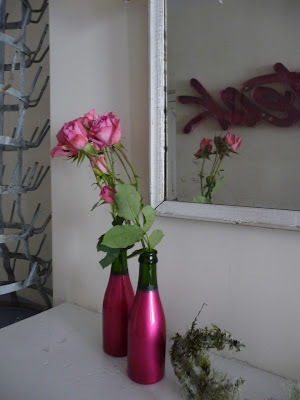 Remodelista’s “5 Quick Fixes: Bright Pink Accents” http://remodelista.com/posts/5-quick-fixes-bright-pink-accents got me thinking. I love a splash of hot pink here and there. So just in time for Valentine's Day here are some of my bright pink accents. Mini champagne bottles saved from a bridal shower. I thought these were fun, so I kept them and use them as vases from time to time. 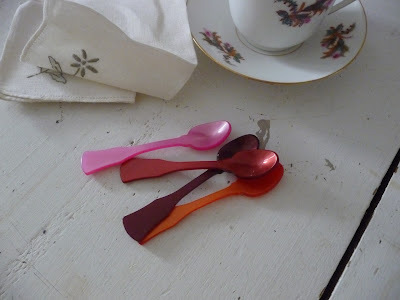 Sabre acrylic demitasse spoons. 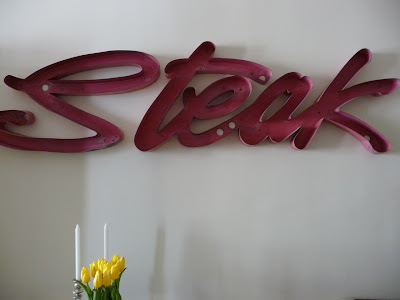 These are available at www.Gracioushome.com in every color (not just pink), as well as various sizes. I use mine for tea, or for dips and spreads served in white dishware to accentuate the bright colors.